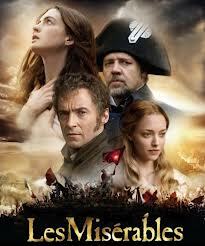 THE LES MIS MOVIE – A FIVE STAR MASTERPIECE! It has been an extraordinary achievement to transform this world renowned, through-sung musical into a thrilling cinematic experience that excels in its naturalism without losing its essential theatricality and retaining the DNA of the show that has become, over the years, an international cultural phenomenon. The film is everything you could hope for and more, with a stellar cast singing live on set, a huge orchestra, fast paced action, heart-rending pathos, the most incredibly intimate close ups and awe-inspiring epic panoramas. The film was produced by Working Title, one of the UK’s most accomplished and prolific production companies, with producers Eric Fellner, Tim Bevan and Debra Hayward, together with Cameron Mackintosh. It was directed by Tom Hooper and the screenplay was written by William Nicholson, working with Alain Boublil, Claude-Michel Schönberg and Herbert Kretzmer. Having the original creative writing team on board was key to allowing the film to have a life of its own while keeping true to the very essence of the stage show and the Victor Hugo novel itself. In fact the film allows for some additional storytelling and clarification drawn directly from the novel. 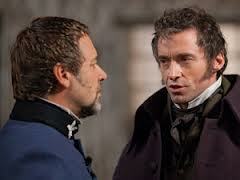 For example we see more clearly Javert’s subservient relationship to Valjean in his position of Mayor of Montreuil and we see how Valjean and little Cosette escape from Javert when they arrive in Paris, finding refuge in the convent with the aid of Fauchelevent, who Valjean had previously rescued from beneath his cart. 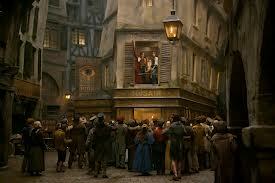 We also briefly see something of Marius’ grandfather Monsieur Gillenormand. There are many of these little additional scenes and they add a new texture and interest to a story that has become so familiar through the musical. New material was written first in the form of dialogue by Nicholson before being transformed into recitative with new music by Claude-Michel and new lyrics by Alain and Herbert Kretzmer. There are just a few spoken lines here and there and, with a couple of rare exceptions, the transition between speaking and singing is effortlessly smooth. Claude-Michel also wrote additional symphonic music to underscore the purely visual scenes and so the much-loved music, played by a 70 piece orchestra, with wonderful orchestrations by Anne Dudley and Stephen Metcalf, is absolutely sensational and makes even more of an impact than it does on stage. 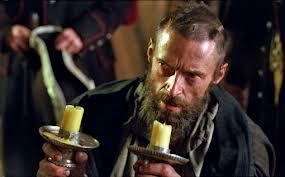 There is one completely new song ‘Suddenly’ which Valjean sings in the coach taking him and little Cosette to Paris. It’s a beautifully tender song with a delicate melody and lyrics that reveal the unexpected feelings that are stirred by his having Cosette to care for. Dispensing with the two act structure also allows for a few songs to be moved to a different position. So that ‘I Dreamed A Dream’ now comes after Fantine has reached her lowest ebb of despair as a prostitute after selling her hair and, in the film as in the novel, also her teeth. Placing it here rather than immediately after she has been dismissed from the factory it gains in pathos immeasurably. ‘On My Own’ comes straight after Eponine has found Cosette for Marius and so reflects even better her sense of rejection. 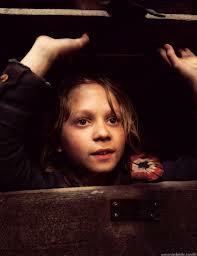 Now it is Gavroche that takes the letter that brings Valjean to the barricade instead of Eponine. 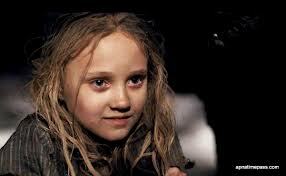 She is fighting alongside Marius and she puts herself in the path of the bullet aimed at Marius and saves his life. There are indeed things that can be done with the benefit of close up on film that couldn’t work on stage. There are occasional lyric changes in the well known songs that can be a bit disorientating for those who know the show word for word, but not in a bad way. They are just little shifts of focus which work perfectly well in the film. One song that is missing is Thénardier’s ‘Dog Eat Dog’. In the extraordinary realism of the sewer scene it just wouldn’t work to have a stand alone song. Although it is a shame in a way because you miss that third philosophical/theological point of view of Thénardier’s godless world. Tom Hooper’s brave and risky decision to have the actors sing live on set is amply rewarded. In the normal way with a musical film the soundtrack is put down in a studio a few months ahead of filming. 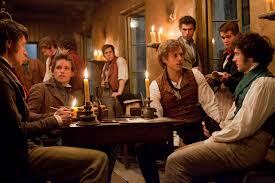 But Les Misérables is a through-sung musical with inherent differences from a musical with dialogue and song. Hooper explains: ‘I wanted to take a risk and do something in a very different genre. From the beginning, what excited me was the idea of doing it live. I don’t think I would have done it if it turned out not to be possible to direct the film live, because no matter how good the synchronisation is of actors singing to playback, an audience can tell that there’s something unreal about it. It doesn’t feel connected to what’s occurring on screen … it denies the actor the opportunity of being in the moment because they have to stick to the millisecond of a plan laid down months before. Whereas, when they sing live an actor has the freedom to create the illusion that the character is acting in the moment, which has a profound effect on the power and the realism of the performance. There’s so much emotion in Les Misérables, and I wanted the actors to have options which might be created by the performance – options which they would be unlikely to have in a recording studio months before.’ Simon Hayes was responsible for capturing the live sound: ‘the actors were given hidden earpieces, which allowed a live on-set pianist to play into their ears. The pianist watched the live performance on a monitor so that the actors could dictate, by their movements, where the melody and tempo should come. The voices were also recorded without the piano accompaniment, which allowed an orchestra to score correctly in the post production phase of the film.’ Stephen Brooker, who has worked on the stage show many times, was the musical director on the film. The actors had the opportunity to sing the songs live many times over, with each take different, in the search for perfection, often singing the same song 15 or even 20 times or more, which certainly required huge vocal stamina. 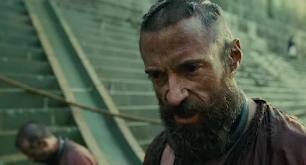 Hugh Jackman performs the role of Jean Valjean with great credibility and integrity. 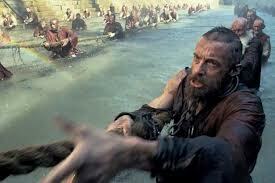 With shorn head, gaunt face and unkempt beard he is virtually unrecognisable at the beginning of the film as the convict ordered by Javert to lift the gigantic flagpole, thereby showing a super-human feat of strength. 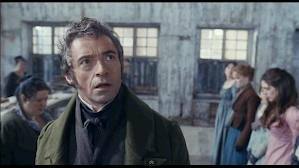 It’s a nice, cohesive touch that helps us understand how ‘a mem’ry stirs’ later for Javert when he witnesses the Mayor’s formidable strength in lifting the cart that trapped Fauchelevant. 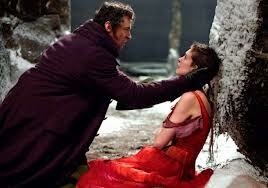 Jackman is utterly convincing as he experiences the remarkable range of emotions inherent in the role. He copes ably with the vocal challenges although, sadly, ‘Bring Him Home’ is not the breathtaking highlight it is on stage, partly because the constant movement loses that mystical sense of stillness and reverence. 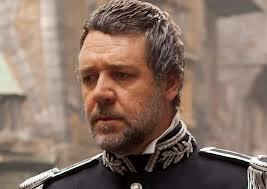 Russell Crowe is a revelation as Javert – it feels like a role he was born to play – he is Javert! 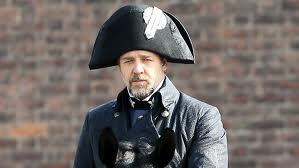 As Claude-Michel says ‘When you see him him working he is achieving your original vision of Javert. They used to say the silence that followed Mozart still belonged to Mozart. When Russell’s leaving the stage, there’s still something of him there. 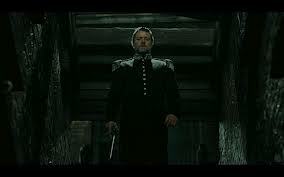 He has a presence you can’t imagine, and a fantastic vision of Javert.’ Although Javert is implacable in his upholding of the law Crowe brings a humanity to him and when he pins his own medal to Gavroche’s body it is very moving. His rendition of ‘Stars’ is different from any I’ve heard before. It’s an unusual vocal performance but one that I find most addictive. He performs the song walking along the very edge of a high rooftop overlooking Paris and each carefully placed step reveals his fearless commitment to his perception of justice. This scene cleverly resonates visually with his later suicide scene as we again follow his step after step on the edge of a high bridge, so we are reminded exactly of what it is he stands for, and why, when his beliefs are turned on their head, he can no longer continue. 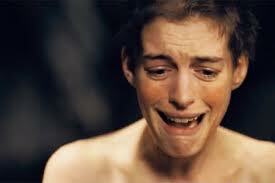 The standout performance, however, is undoubtedly Anne Hathaway’s Fantine. It’s virtuoso performance because she brings to the role such a degree of truth and intensity that it exposes her genuine empathy for the character. Allowing us to witness her utter degradation in the very act of prostitution, the intimate close ups of her face show her absolute despair while her voice reveals the raw emotion of ‘I Dreamed A Dream’ in a way never previously heard and completely unforgettable. It’s a testament not only to her amazing acting skills but also to Hooper’s savvy direction, in particular his decision to have performers sing live and in the moment and also to use such extraordinarily close visual images. It’s like, as I believe Hugh Jackman said, having the best seat in the theatre that doesn’t exist, because you are right there in it, face to face. Amanda Seyfried as Cosette and Eddie Redmayne as Maruis play convincing lovers. It’s harder to get away with such romantic, flowery lyrics in ‘In My Life’ within the realistic framework of the film but they do so admirably. Redmayne has a great voice and his ‘Empty Chairs At Empty Tables’ is a vocal and emotional sensation. Samantha Barks is absolutely terrific as Eponine and her rain sprinkled ‘On My Own’ is a real vocal highlight. 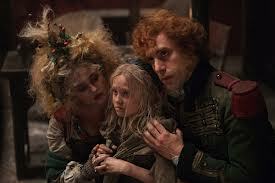 Sacha Baron Cohen and Helena Bonham Carter make a rather handsome and colourful couple as the greedy, thieving Thénardiers and they are probably truer to the novel. But the extended focus on their remarkable sleights of hand and pick-pocketing skills somehow blunts the rip roaring, jolly humour of ‘Master Of The House’, which is a much needed moment of light relief. 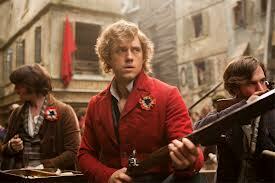 Aaron Tveit as Enjolras and indeed all the students play their roles well. In fact it is in the ensemble numbers that the singing is closest to that in the show. Enjolras’s death was one of the most moving moments for me and I loved the way they retained the same image of his dead body hanging inverted – it’s such a poignant moment and the kind of thing that is a wonderful homage to the stage show. Colm Wilkinson has a lovely cameo role as the Bishop of Digne and when Valjean’s spirit moves towards him at the end it feels entirely fitting. Daniel Huttlestone’s Gavroche is exactly the cheeky, street wise little urchin we all imagine and it was nice to see a bit more of young Eponine, well played by Natalya Wallace. It’s hard to imagine the part of young Cosette being played now by anyone other than Isabelle Allen, who inhabits the role with total credibility and a beguiling innocence. Watching her facial expressions as the Thénardiers and Valjean are doing the deal for her is just priceless and in ‘Castle On A Cloud’, when she whispers ‘Cosette, I love you very much’, how can you help but fall in love with her? 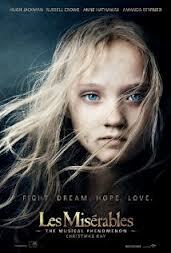 Les Misérables is very much about ensemble storytelling and the big ensemble cast as well as the huge number of extras all did a brilliant job of bringing this intriguing story to cinematic life. Eve Stewart was the production designer and did a fantastic job of seamlessly mixing real locations with studio sets. The only scene set in France was the early mountainous landscape of Gourdon because the city streets of Hugo’s Paris no longer exist. One of the dry docks at Portsmouth Naval Dockyard, used for the spectacular opening sequence, was filled with water and the wave and wind machines aided the illusion of a gigantic, battered ship being hauled in by the convicts. Chatham in Kent, another historic dockyard, facilitated several other sets. Fantine’s factory set was created in the Tarring Yarn House, while the hospital scene was set in the cockloft of the ropery. Chatham also provided the location for the streets of Montreuil-sur-Mer and its red light district, which was seamlessly integrated with the Lovely Ladies set at Pinewood studios. The big panoramic street scenes for Lamarque’s funeral procession were shot at the Old Royal Naval College at Greenwich, with the addition of a 40 foot tall polystyrene replica of the Elephant of the Bastille, which was home to Gavroche and the other urchins. 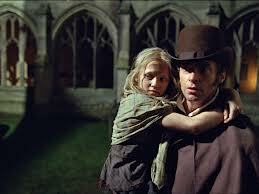 The scene where Javert pursues Valjean and Cosette through the streets of Paris was shot in Winchester’s cobbled streets, while the chapel of Winchester College was used for Valjean’s death. Boughton House in Northamptonshire was used for Marius Pontmercy’s home and Javert’s suicide was shot at the weir on the River Avon in Bath. At Pinewood studios one sound stage was transformed into the red light district of Montreuil-sur-Mer. The realism for the actors on this set was created not only visually but with crates of mackerel, brought in so it actually smelled like a real harbour and it was kept deliberately cold so that the actresses playing prostitutes would be genuinely shivering. They created the rotting hull of an old ship mired in mud to give authenticity to the scene where Fantine lays with the sailor and then sings ‘I Dreamed A Dream’. A second sound stage served as a vast replica of an underground Paris sewer, while the tallest sound stage, the newly built Richard Attenborough Stage, was used to render the streets of 1832 Paris. The tall, ramshackle buildings included houses, cafés, a blacksmith and a dairy. The Café Musain, where the students meet is a centrepiece at the convergence of two streets so it’s isolated from the other buildings and its very insubstantiality is a symbol for the students’ vulnerability. 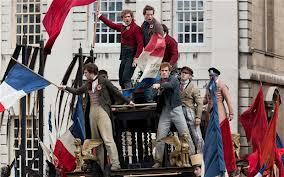 The barricade was built live on set and filmed, with the students ripping up and throwing down bits of furniture, doors, cases, even a piano and it captured exactly the energy, revolutionary fervour and realism that Hooper was aiming for. Realism is the key word in the film and it’s very different from the theatre where you already have a much greater capacity for suspension of disbelief. People will always go to the stage show because they want to hear glorious singing and see great live performance, but the film is able to reinterpret the story and bring it alive in a completely new and exciting way. Cinema’s greatest assets are the huge panorama and the intimate close up. 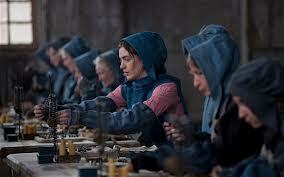 Les Misérables is one of the most emotive musicals ever written and as Tom Hooper has said: ‘it mainlines emotion.’ The wonderful solos filmed in such close focus reveal every nuance in the life of the character’s mind and it’s that very proximity that generates such extreme reaction in the viewer. I wouldn’t like to say that the film is better than the stage show but it’s a worthy equal in a very different medium and it will surely reach a new audience. The film would never replace the stage show, which has evolved considerably over its 27 year history and no doubt will continue to do so with new casts and new interpretations, while the film will remain forever the absolute cinematic masterpiece that it now is.